The tour was event more than we expected. Anna was truly outstanding. Her knowledge of the history of Barcelona coupled with her familiarity of the city made the tour special and worth every cent!! Rodrigo was amazing - incredibly well informed, fun, energetic and engaged. Highly recommend this tour! Feliciano was a great tour guide. The six of us had an enjoyable time touring Barcelona. The places we visited were the usual popular attractions. We went on the day of the Catalonia celebration/protest with 1 million people in the streets, so finding parking was challenging. Our guide did well and was knowledgeable and friendly. It was an expensive way to see the sights, but we felt it was worth it. We had enough time at the different sights to take it in. Our guide was very knowledgable but a bit distant in her presentation. We arrived in Barcelona only two days after the terrorist attack on Las Ramblas, but both the locals and most of the visitors chose to continue their lives and tours without fear. Our driver/guide for the half-day tour was Felipe, of Explore Catalunya, and he was EXCELLENT. 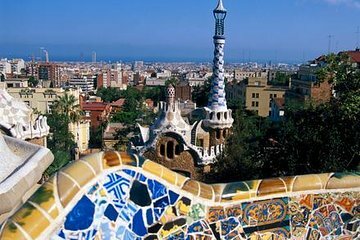 Spoke very good English, was a careful driver, and gave us a driving tour past EIXAMPLE, to MontJuic to overlook the city, the Olympic stadium, and later got us quickly through the crowded La Sagrado Familia line, where we met at the bookstore after our audio tour. Instead of going to La Boqueria, through which the terrorist driver escaped, he took us to the locals' market, Santa Catalina, where we later enjoyed lunch we had been to Las Ramblas and La Boqueria a week earlier. Our walking tour took us through the Gothic Quarter, Jewish Quarter, Cathedral Maria de Mar, El Born, and many other sites that were not originally on our list. Felipe was flexible and stopped at the Palau de la Musica Catalana, which was not on the tour, to check tour times. My wife and daughter-in-law returned there after lunch to see the beautiful glassworks. When we asked about a good place for dinner, Felipe took us to see two different restaurants and got business card from each so we could make the final decision. Our family chose and returned to Tapeo later and the food and service were excellent. At the end of the tour we asked to be dropped off at Santa Catalina instead of the Cathedral Maria de Mar, which Felipe was happy to do, ending a really wonderful and rewarding touring day. Outstanding customized experience with remarkably well informed guide who spoke perfect English. Highly recommended. This tour was BY FAR the highlight of our entire trip. Rodrigo was so knowledgeable, friendly and patient with our two children - ages 4 and 11 - and kept the entire family engaged throughout the tour. We were skeptical at first because of the price but it was worth every penny. Highly recommend!! We learned so much and Rodrigo's our tour guide historical knowledge and enthusiasm made it that much more special.